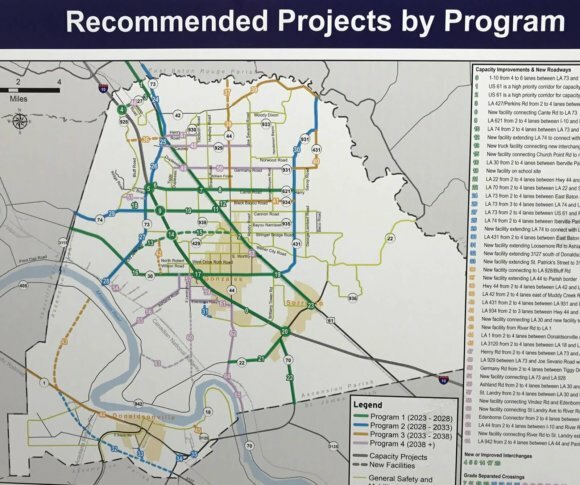 The knockout punch in HNTB’s $800,000 Master Transportation Plan was the $1.25 BILLION price-tag to fix East Ascension’s broken transportation network. 64 recommended projects, none of them funded, were enough stagger visitors to the Governmental Complex on Thursday, punch drunk as the dire reality of Ascension’s road network sank into the semi-consciousness. And the prohibitive cost projection omitted the engineering firm’s fantastical recommendation to build a bridge across the Mississippi River linking Geismar (east bank) to the sugar cane fields of Modeste (west bank). Mason pointed out that five of the last seven residential subdivisions approved by Ascension’s Planning Commission are located within the boundaries of District 11 where he hopes to unseat the incumbent, Benny Johnson. “A pipe-dream, a total waste of time and taxpayer dollars,” was District 10 hopeful Jeff Pettit’s take on HNTB’s work product. Not a complete waste of time. When will there be another chance to get these guys together for a photo op? 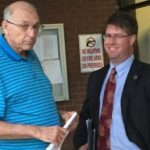 “Might as well have kept the new Mississippi River bridge in since none of it is ever going to be built,” Pettit quipped.